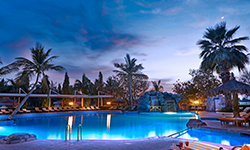 MUSCAT, Oman - Jan. 18, 2018 - PRLog -- Al Nahda Resort & Spa, one of the luxurious resorts located near Muscat, has come up with new offers and all-inclusive packages. Nestled inside a 30 acres mango orchard with a lot of greenery around, the resort is a heaven for those who love to stay close to the nature. Al Nahda Resort & Spa is a place which encourages guests to unwind in a peaceful and soothing setting, with suites, restaurants and other facilities offering every conceivable convenience and comfort. 1.Winter Express De-Stress (Duration 2 hours) - Spoil yourself this winter with energizing Spa offers at our award winning URU Spa! 2.Oriental Rhapsody (Duration 2 hours) - A perfect escape to revive and retain the harmony for the mind, body and soul. 3.Ultra Luxury Offer - Enjoy a memorable stay close to nature, and experience quality services, warm hospitality and soothing environment. 4.Touch of Venus (Duration 2 hours) - Indulge in relaxing Aromatherapy treatments at URU spa to forget your every day's chaos.